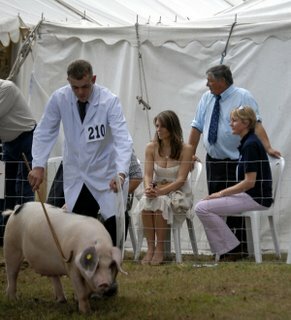 Ok, so this isn't technically a photo of a celebrity eating, but who can resist a photo of Liz Hurley watching and quite possibly rating a hog? Maybe it's her piggy. Strange hobby. But then again, she is British. sooooo, if you don't care and you don't see the humour in any of this....then why r u here? Oh brave, anonymous spouter of boring things. British people don't all live in large houses in the country and have pet pigs you know. You're right. They all live in extraordinarily small houses and they eat overcooked pigs for Sunday dinner. Oh the irony of this pic. ummm.... what she dressied up fur??? She wook purrty, but she wook cold. And da piggie don't care. me sorri, but dat's funni. who rates pigs???? friggn loser! "I would kill myself if I were as fat as Marylin Monroe." Elizabeth Hurley is so perfect, she's retarded.